At this point on the trail we were grateful for the aggressive tires, rebuilt suspension and steering, and quality brakes. Recently the Dirt Wheels crew went on an in-depth tour of Power Sports Nation’s (PSN) ATV and UTV salvage operations and we were impressed. Feeling that more evidence would be welcome, PSN set out to resurrect a sublimely tired, but nonetheless well-maintained, 2014 Polaris Ranger XP 900. How tired? How about 31,014 miles accumulated during 4,609.7 hours of operation? Both our staff and the PSN crew are of the opinion that this is the highest-mileage/-hours Ranger we have ever seen or heard of. This machine maintained a lifetime average of 6.7 miles an hour. It was used on a Ranch in South Dakota. It wasn’t a pleasure unit, but a tool that was wielded every day and all year long. Once it was started in the morning, it didn’t get shut off until the sun went down. It was maintained well during its farm life, but PSN ended up with this unit once the engine was finally too tired to run. PSN could have scrapped it out, but they decided to save the life of this legendary UTV. It was destined to become the PSN shop/trail machine. Trails like this ravine climbing up from the banks of the Missouri River proved a fun but challenging test for the renewed Ranger. 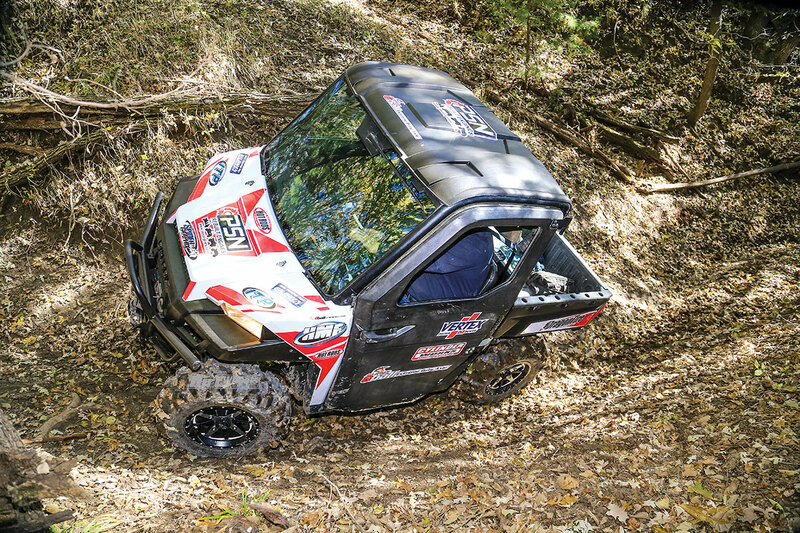 All projects should start with a plan, and the goal for this Ranger was to resurrect a high-mileage machine to showcase to Power Sports Nation’s capabilities. They built a machine to use around the acreage and to take trail riding. It honestly was in better shape than many of the UTVs that come through the PSN shop. With a full cab, radio, heater and winch, it was well-equipped from the factory. The first step was to get it stripped to the frame to see what shape it was in. The engine wouldn’t run, the suspension was loose, its transmission was grinding, and it was tired all the way around. Once the tear-down was done, tech Tyler Murphy noticed that the lower A-arm mounting tabs were ripping out of the front frame section. This is a common issue with abused machines, so Murphy called Tater Toys and ordered a heavy-duty, weld-in front frame section. Murphy cut out the lower section and welded the replacement in. It should never be a worry again. Moving to the engine, Murphy tore it down and found that it was just worn out. He pulled a PSN fully rebuilt engine and transmission off the shelf and dropped them in place. PSN uses a custom setup of a Hot Rods’ crankshaft and Vertex pistons in their Ranger engines. PSN uses Cylinder Works cylinders, Vertex pistons, Hot Rods crankshafts and bearings, and Winderosa gaskets. The fully rebuilt engine comes with a six-month warranty and free shipping. With these parts, they are confident that this engine could go just as many miles as the original with proper maintenance. The transmission gets the same treatment, and pairing both allows the Ranger to run like new. To help the engine perform better than new, PSN reached out to Gilomen Innovations for an ECU tune and clutch kit. In PSN’s opinion, the stock Ranger 900 can use more power, and the clutching is not as smooth as it could be. The Gilomen tune upgrades the Ranger from 60 horsepower at the crank to 78! You get full power in every gear instead of limited power, and the fan is programmed to come on at 184 degrees instead of 204 so your machine stays cooler. The speed limiter is disabled as well. The clutch kit lets that power transfer smoothly from the engine to the wheels with no jerking or lurching. It allows you to drive the Ranger in tight technical conditions with ease and excellent belt life. Gilomen does custom tuning for any special modifications like the HMF exhaust on this machine. 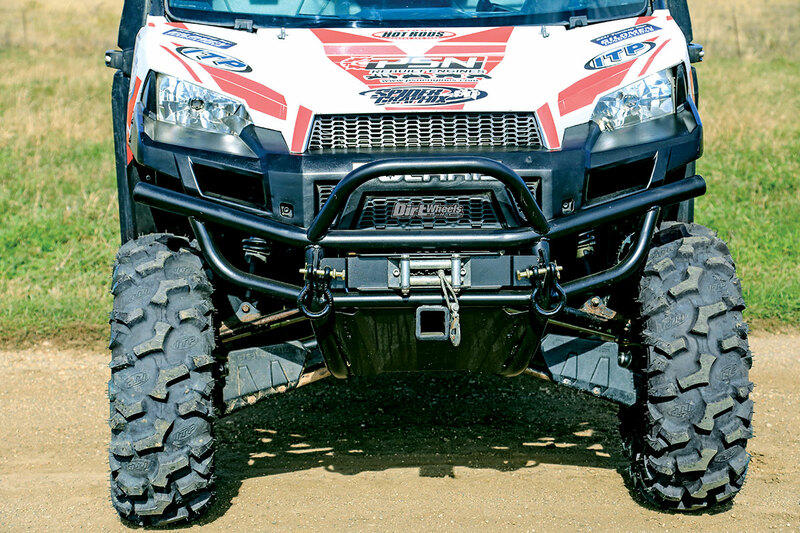 Tyler Murphy customized this front bumper to toughen up the front end, add a hitch mount, boost tow points and mount a winch. Once the engine and transmission were installed and dialed in, Murphy and PSN focused on replacing every bushing and bearing. All Balls had every part needed to make the Ranger feel like it was brand new. A couple of the A-arms were bent, so PSN grabbed used replacements off the shelves. The shocks were tired, so more used parts were employed. All Balls’ new Stealth driveshaft was installed to reduce the in-cab noise that comes from an unbalanced driveshaft. Heavy-duty 8Ball axles were the easy, affordable choice, and they take abuse well. The body on the Ranger was in pretty good shape, but it had some broken trim pieces, worn-out seats and it needed a new bed box. PSN was able to go to the shelves and get all the parts needed. The PSN Ranger’s Gilomen engine and clutch tuning made it a weapon on technical sections. The engine performance is extremely impressive. With the mechanical side buttoned up, PSN and Murphy were able to get to the fun stuff and start making the Ranger look good. 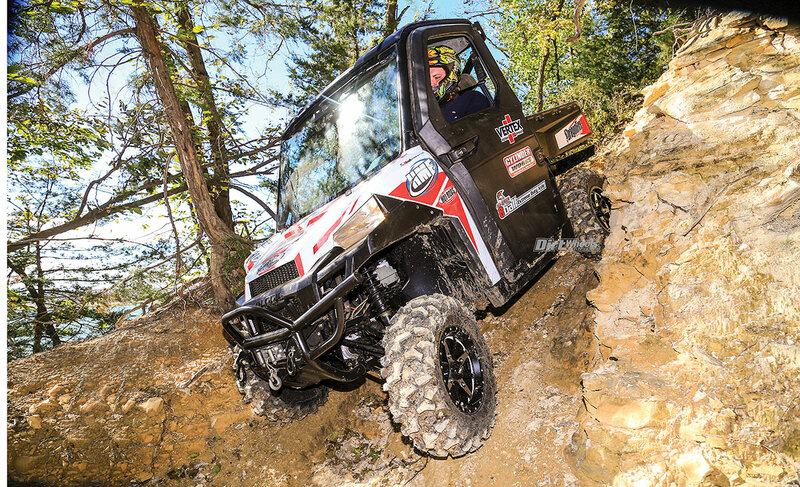 They started by gaining ground clearance and getting the right stance on the Ranger with a 2-inch lift kit from DragonFire Racing. 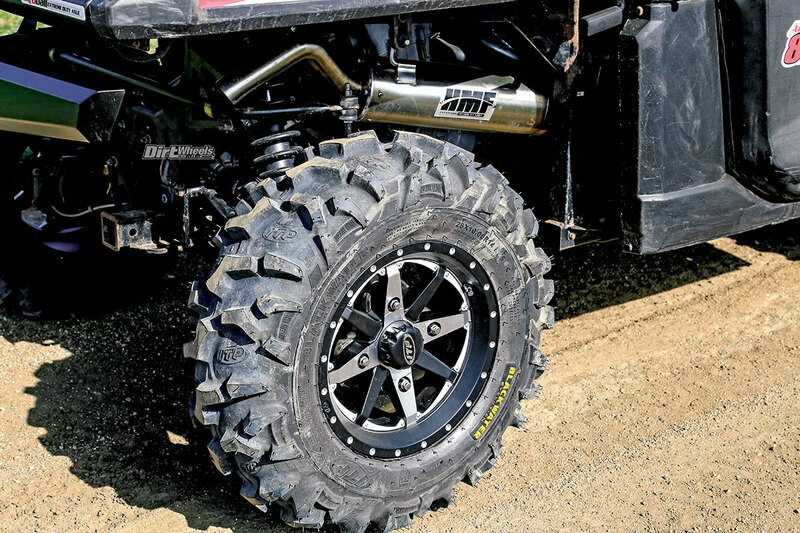 With the lift kit, PSN had clearance for bigger Blackwater Evolution tires on ITP Cyclone wheels. In the Midwest, the Ranger needed the aggressive Blackwater tread pattern. Cyclone wheels come with red, white and blue inserts to perfectly match the machine. 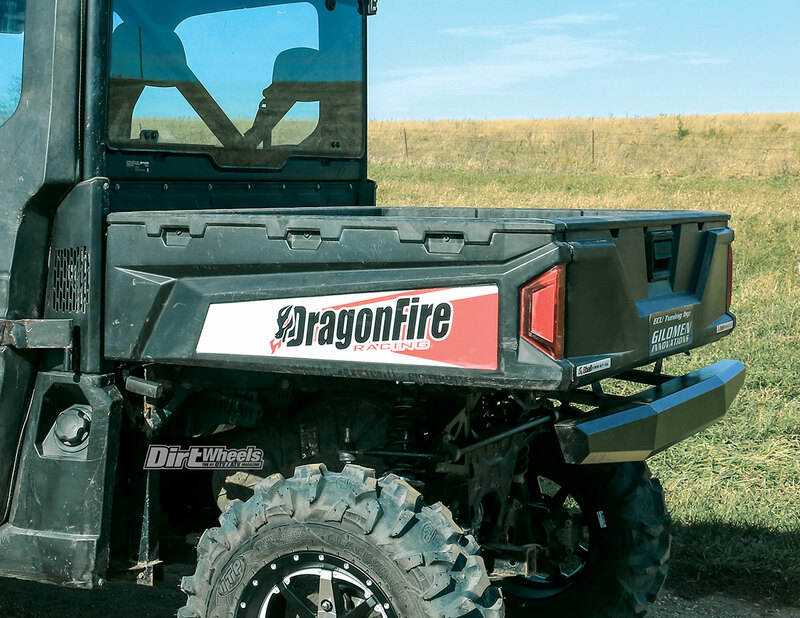 DragonFire has a strong rear bumper that will protect the machine if it happens to back into a tree on a trail. Out front they custom-modified the front bumper. They wanted a little growl from the machine but still wanted to be respectful when on the trails, and an HMF exhaust did just that. It not only looks great, but it has a great sound that you can listen to all day. 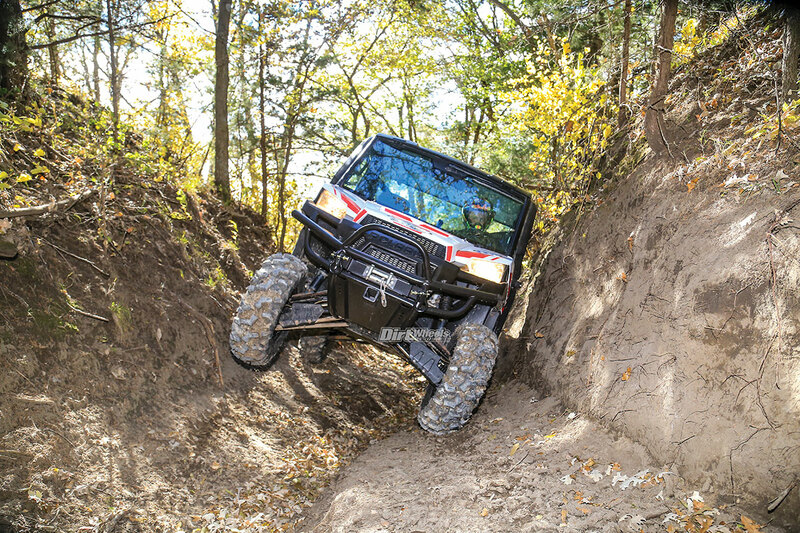 Between the taller ITP tires and the Dragonfire lift kit, the Ranger grew some much-appreciated ground clearance. 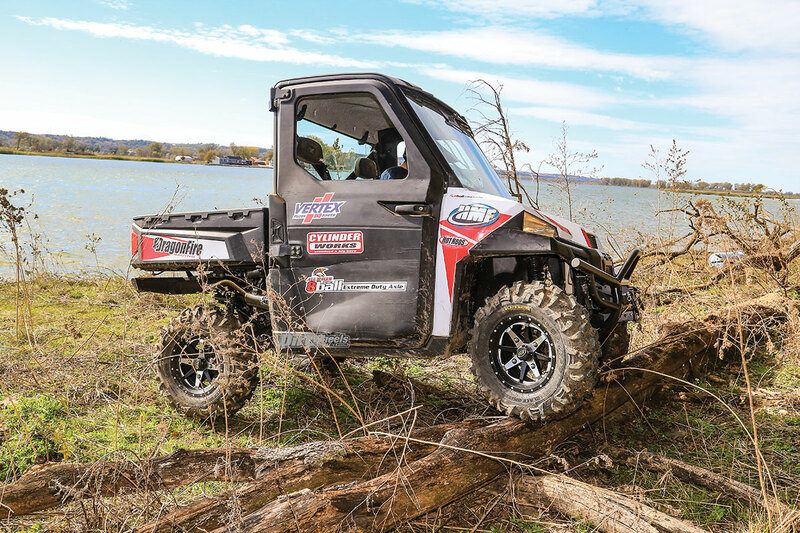 We loaded up the freshly rebuilt Ranger XP 900 and headed to Talsma’s Trail Park on the South Dakota side of the Missouri River. Frankly, we wouldn’t normally use a utility machine for sport trails out west, but the tight and technical terrain at Talsma’s was a perfect playground for the resurrected Ranger. We have some experience with the closed-cab Ranger, and for Midwest weather, they are highly desirable. This Ranger came equipped with power windows and a heater. We had pleasant weather, so the heater wasn’t needed, but we gave the windows a workout. ITP wheels and larger ITP Blackwater Evolution tires helped with traction in all situations, plus they added style and ground clearance. Many of the trails were tight and narrow as we approached the Missouri River, and it was comforting to have the doors as we rubbed some banks. From the instant we left the staging area the tight feel of the Ranger and response of the engine were most impressive. The engine is strong, the transmission shifts easily and the suspension handled everything we put in its path. This is a machine you could put to use around the property for work, or use it to run trails all day. It feels like it is ready for another 30,000 miles. The stock bed was cracked, so Power Sports Nation replaced it with a better one. The Dragonfire bumper will help keep this one in better shape. For any resto project, it is important to pick the right starting point. For most off-road hobbyists looking for a project machine, a Ranger with this many miles on it would likely be a poor choice. But for a company like Power Sports Nation, this was the perfect vehicle. It showed the range of parts and services the company offers perfectly. They had parts in stock to replace the shocks, bed, seats, engine and transmission, in addition to some damaged suspension arms. They literally returned this machine from the dead to become a willing and able machine ready for anything. Is it better than a new Ranger? Nope. It is, however, better performing than a new 2014 Ranger. For now that is enough, and the PSN crew is busy accumulating that second 30,000 miles. 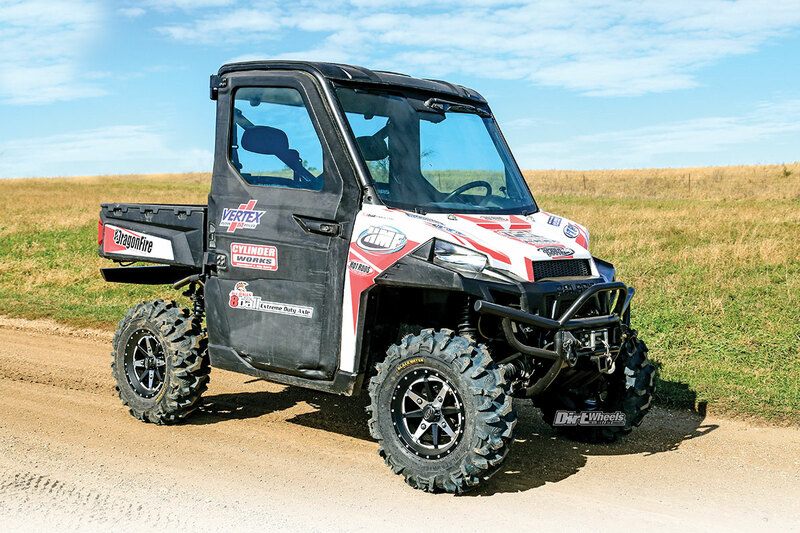 This 2014 Polaris Ranger XP 900 had expired after 30,000 miles of hard farm life, but Power Sports Nation resurrected it to become this potent machine. 14×7 Cyclone wheels $120 ea.